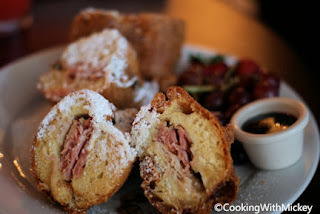 Savor this twist on the classic Monte Cristo at Blue Bayou and Cafe Orleans in New Orleans Square. This sweet and savory version differs from the original as it's not batter dipped and fried like french toast. If you are looking for the best Monte Cristo, this is the one you must try! Line a cookie sheet with paper towels; set aside. Whisk the egg and water together in a mixing bowl. Add flour, salt, and baking powder and whisk thoroughly for 2 to 3 minutes or until smooth, scraping sides of bowl. On one slice of bread, arrange 2 slices of ham, turkey, and cheese, covering the bread evenly. Place another slice of bread on top and slice each sandwich in half diagonally. Heat oil to between 365 degrees F and 375 degrees F in a 10-inch pan. Do not let the oil reach a higher temperature than this; if the oil starts to smoke, turn the heat down. Dip half of the sandwich into the batter, allowing excess to drain, and very carefully place into the oil. Repeat with the other sandwich half. Cook 3 minutes on each side, or until golden brown. Place the cooked sandwich on the prepared cookie sheet in a warm oven until ready to serve. Repeat with the other three sandwiches. Cook one at a time, and allow the oil to reach the desired temperature between each. Sprinkle with confectioner’s sugar and serve with blackberry preserves on the side.